Sustainable Cowboys Or Welfare Ranchers Of The American West? Five hundred million dollars. That's what 21,000 ranchers who graze their livestock on America's iconic western rangelands are estimated to have cost US taxpayers in 2014 - and every year for the past decade. This averages out to an annual taxpayer subsidy of $23,809 per rancher - approximately a quarter of a million dollars each since 2005. So why does this small subset, representing just 2.7 percent of US livestock producers, protest the "welfare rancher" label? The public lands grazing program is welfare. That $23,809 - and it's a lowball figure - is a form of public assistance similar to other welfare programs. The only difference is, it doesn't arrive as a check in the mail. It instead represents a loss covered by taxpayers: the very large difference between what public lands ranchers pay in fees to the US government and what public lands grazing costs taxpayers every year. But it's still a subsidy, as a newly updated economic analysis, "Costs and Consequences: The Real Price of Livestock Grazing on America's Public Lands," makes clear. And the recipients aren't low income; a large number are millionaires and some are billionaires. Cattle barons, if you will. Public lands ranching costs western ecosystems, wildlife and taxpayers. 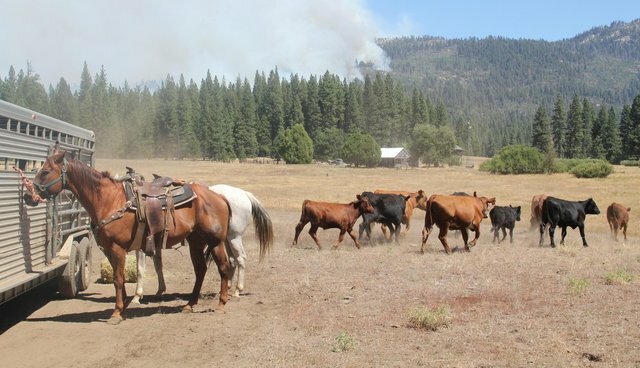 "Several federal agencies permit livestock grazing on public lands in the United States, the largest being the U.S. Department of the Interior's Bureau of Land Management (BLM) and the Department of Agriculture's United States Forest Service (USFS). The vast majority of livestock grazing on BLM and USFS rangelands occurs in the 11 western states of Arizona, California, Colorado, Idaho, Oregon, Montana, New Mexico, Nevada, Utah, Washington and Wyoming. Rangelands are non-irrigated and generally have vegetation that consists mostly of grasses, herbs and/or shrubs. They are different from pastureland, which may periodically be planted, fertilized, mowed or irrigated." So says the report, which was prepared by three economists for the Center for Biological Diversity and published in January 2015, the latest of numerous studies (see list at end of this article) to examine a program Americans know nothing about. The 44-page fiscal analysis describes a federal program that exploits not just taxpayers but is ruinous to public lands and the wildlife that inhabit it, a viewpoint shared by rangeland science experts and conservation groups, from Defenders of Wildlife and the Center for Biological Diversity, to WildEarth Guardians, Western Watersheds Project, and many others. An obvious culprit identified in the report (and its predecessors) is the negligible fee that livestock operators pay to graze a cow and her calf or five sheep for an entire month on public lands, otherwise defined as an AUM (animal unit month). In 2014 it was just $1.35 (priced less than a can of dog food) - a figure that is the lowest fee that can be legally charged. The $1.35 figure has barely budged over the past 34 years and is well below the market price to graze on private land ($21.60). Fees set by other federal agencies and individual states on public property are also significantly higher. In 2014, BLM and FSIS permit holders paid an estimated $18.5 million in fees to graze 1.14 million livestock "units" on the 229 million acres of federal land used for grazing. But only a fraction (between one-third and one-quarter) of that $18.5 million actually went into the US Treasury, according to the report. The majority was diverted to range rehabilitation and improvement funds to construct fences for containing livestock, and improving vegetation and forage. In other words, two-thirds to three quarters of the low fees ranchers pay go right back into their pockets, leaving approximately $7.9 million to help defray total costs ... which are, well ... enormous.